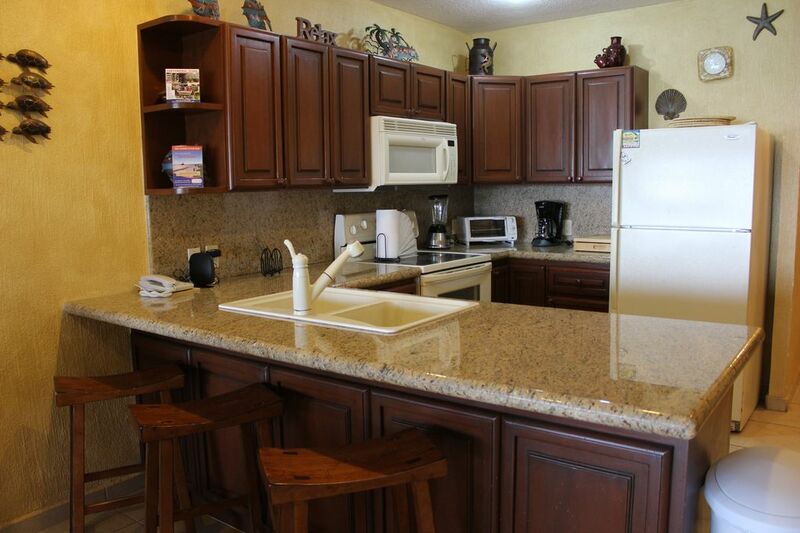 This is a beautiful 2 bedroom 2 bathroom condominium located on the 9th floor of the East Tower of the Sonoran Sun Resort. The Resort boasts a complete fitness center, Emiliano´s Restaurant Bar, beachfront swimming pools, Jacuzzis, tennis court, basketball backboard, BBQ area, beach palapa's, full service SPA, convenience store and computer room. This condo has a maximum capacity for 4 persons 2 in each bedroom. The large living space flows out onto the expansive balcony, bringing you terrific views , right above the ocean! DVD players, and wireless internet afford extra entertainment options.The dining area has a beech wood table that is set to seat 4 people. The master bedroom is a suite with it's own shower, bath , and double vanity sinks. There is a convenient seating area as well. The 2nd bedroom has a bright red painted wall with a queen size bed with gold and red striped bedding. The room also comes with a large double door closet. The unit has two bathroom the first one in the master bedroom and the second on the hall. The terrace is furnished with a round dining table, chairs and two recliners. A small laundry room with washer and dryer is inside the unit as well.